Saddlebag Island is made up of a pair of wooded headlands connected by a narrow low pass, hence the name. Its location near Anacortes and close to Padilla Bay ensure its continued popularity. Saddlebag is a good option when the weather turns against you on the San Juan side of Fidalgo Island. Location: The island is 2.1 mi north-east of March Point, which is due east of Anacortes. 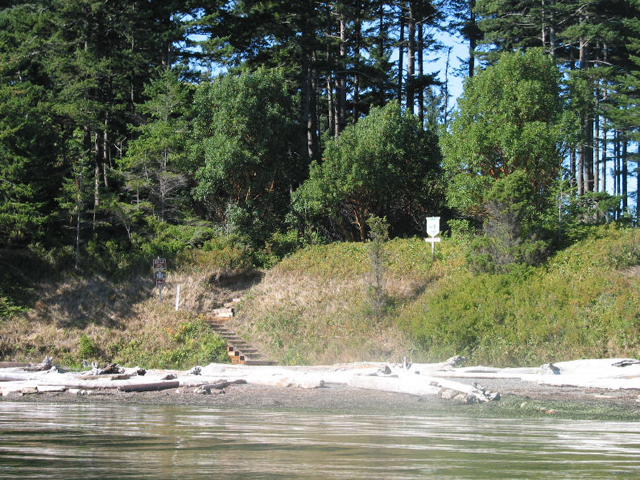 The Cascadia Marine Trail campsite is west of the beach on the southern side of the island. Hazards: Travel in Guemes Channel W of Saddlebag Island exposes paddlers to potential 3-4 knot currents, turbulence, standing and breaking waves. The entrance to Guemes Channel is one of the most treacherous passages in the North Sound area. Special Considerations: Heavy use from nearby Anacortes, especially on weekends. Neighboring Dot Island is a wildlife refuge, please stay at least 200 yards off shore. Natural History: The Wilkes Expedition, 1841, included Saddlebag island as one of the Porpoise Rocks. The US Coast and Geodetic Survey Chart 6577 shows the present name evidently derived from the shape of the island. 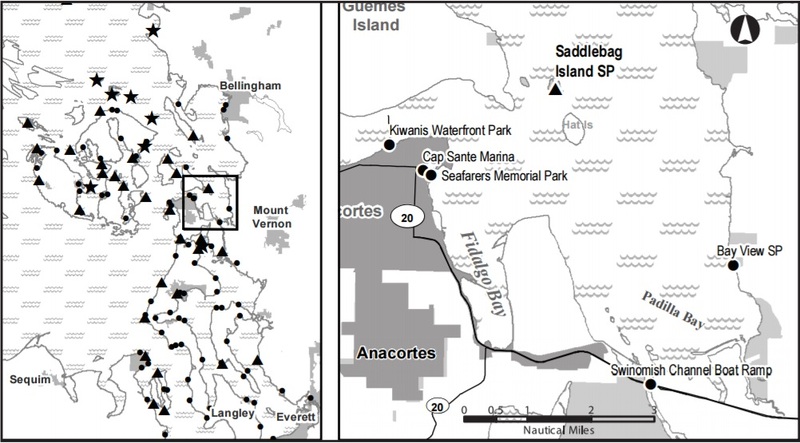 Nearby Padilla Bay is a National Estuarine Research Reserve. The Bay is a fertile estuary at the saltwater edge of the Skagit River’s large delta. Padilla Bay contains nearly 8,000 acres of eelgrass, used as a nursery by salmon, crab, perch, and herring.